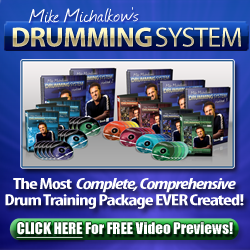 The Drumming System – This 5 Workbook, 20 DVD and 15 audio play-along CD package will show you everything you need to know about playing the drums. The Jazz Drumming System – Learn how to swing, shuffle and play brushes with this comprehensive training pack. The Drum Rudiment System – Master all 40 of the drum rudiments, hybrid rudiments and their various applications to the kit. The Drum Play-Along System – Play along to drumless tracks in Rock, Alt, Pop, Jazz and Latin styles. Workbook included.